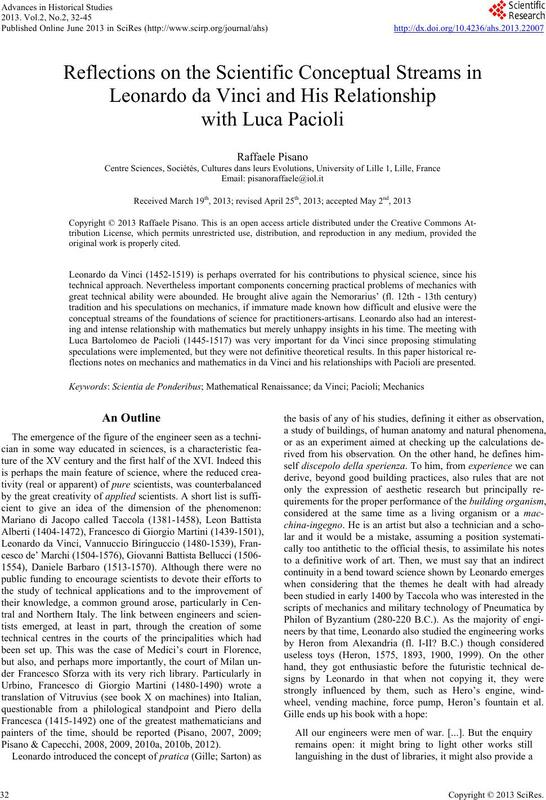 flections notes on mechanics and mathematics in da Vinci and his relationships with Pacioli are presented. Pisano & Capecchi, 2008, 2009, 2010a, 2010b, 2012). wheel, vending machine, force pump, Heron’s fountain et al. been published and which are full of information1. the rich only, since they had a knowledge of Latin and Greek. mechanical devices or of calculating ones within their treatises. approximated and designed on the spot. 1Gille, p 240; see also: Hall, 1997. 2da Vinci, Codex Atlanticus, f. 119v. (1482). It is based on an Arabic translation from original Greek manuscript. 2012; Jesseph, 2004; Pedersen, 1992; Biagioli, 2003; Marcacci, 2009). bodies that are perceptible to the senses5. in physics (Locqueneux) were formulated more geometrico. Clagett, 1964-1984; Tartaglia, 1565a; Dijksterhuis, 1957). part of the science of weights. tate (Tartaglia, 1565b; see also Tartaglia, 1554). Biagio Pellicani of Parma (d. 1416). 7The Summa was a teaching textbook mainly concerning general algebra. of the second half of the XVI century (Pisano, 2011). retical considerations on its object, particularly on the lever law. machines to the lever (dal Monte, 1581, 1588). Salomon in the second book of the Sapientia11. cioli (Pacioli, Summa, f. 3r)12. 2009d; Pisano & Bussotti, 2012; Marcacci, 2009. 8De rebus expetendis et fugiendis consisted of 49 books, 30 on sciences. Valla’s book also contains interesting notes on Archimedes’ works. sistency and the persistence of certain statements over others. bodies out of their natural site14. mortal beings have their origin and their death15. Studies on gravity and force16 (da Vinci, Codex Arundel f. 37r). which do not bend if not for the motion of air or water18. 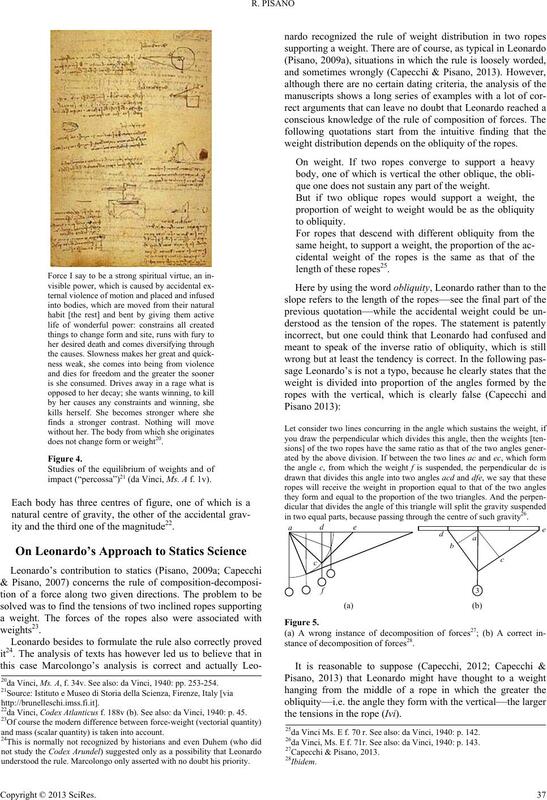 Studies on gravity (da Vinci, Codex Arundel f. 205r). neo-Platonic philosophy of universal animation (Ivi). 14da Vinci, Codex Arundel f. 37r. See also: da Vinci, 1940: p 31. 15da Vinci, Codex Forster II, f. 116v. See also: da Vinci, 1940: p 32.
geometry—(Euclid, 1945) architectural and territorial studies (Pedretti, 1998). Source: London British Library [via http://www.bl.uk/manuscripts]. 18da Vinci, Codex Arundel, f. 205r. See also: da Vinci, 1940: p 30.
does not change form or weight20. impact (“percossa”)21 (da Vinci, Ms. A f. 1v). ity and the third one of the magnitude22. weight distribution depends on the obliquity of the ropes. que one does not sustain any part of the weight. in two equal parts, because passing through the centre of such gravity26. stance of decomposition of forces28. the tensions in the rope (Ivi). 20da Vinci, Ms. A, f. 34v. See also: da Vinci, 1940: pp. 253-254. 22da Vinci, Codex Atlanticus f. 188v (b). See also: da Vinci, 1940: p. 45.
and mass (scalar quantity) is taken into account. understood the rule. Marcolongo only asserted with no doubt his priority. 25da Vinci Ms. E f. 70 r. See also: da Vinci, 1940: p. 142. 26da Vinci, Ms. E f. 71r. 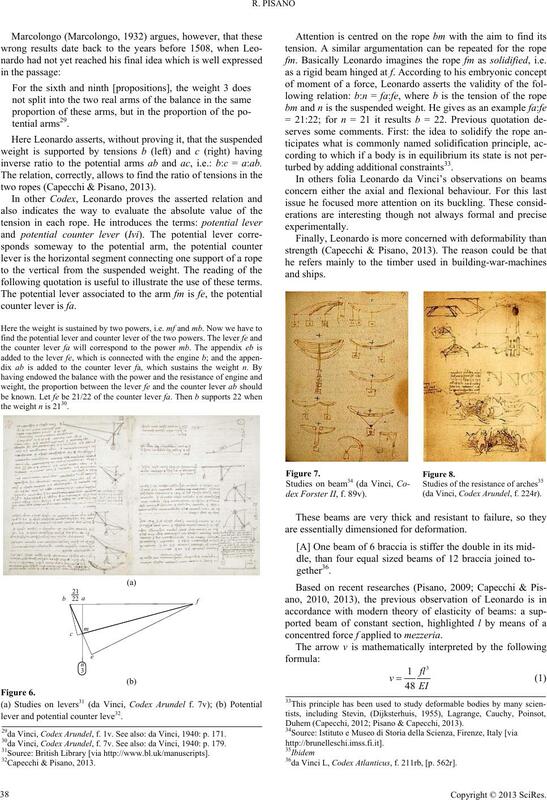 See also: da Vinci, 1940: p. 143.
inverse ratio to the potential arms ab and ac, i.e. : b:c = a:ab. two ropes (Capecchi & Pisano, 2013). following quotation is useful to illustrate the use of these terms. the weight n is 2130.
lever and potential counter leve32. fm. Basically Leonardo imagines the rope fm as solidified, i.e. turbed by adding additional constraints33. dex Forster II, f. 89v). (da Vinci, Codex Arundel, f. 224r). are essentially dimensioned for deformation. concentred force f applied to mezzeria. Duhem (Capecchi, 2012; Pisano & Capecchi, 2013). 36da Vinci L, Codex Atlanticus, f. 211rb, [p. 562r]. 29da Vinci, Codex Arundel, f. 1v. See also: da Vinci, 1940: p. 171. 30da Vinci, Codex Arundel, f. 7v. See also: da Vinci, 1940: p. 179. 31Source: British Library [via http://www.bl.uk/manuscripts]. Nowadays Leonardo da Vinci’s cultural matrix seems clear. perception stored in our memory. 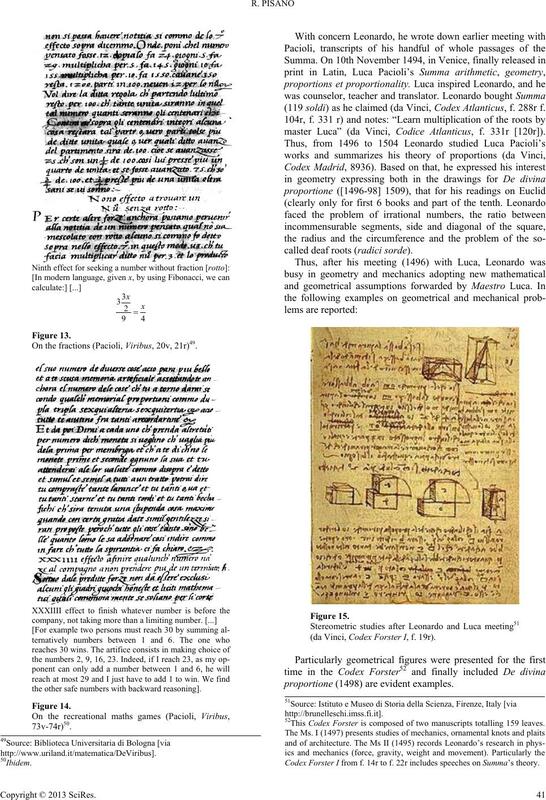 calculus are possible to read in the Codex L, f. 10v, f.
Storia della Scienza, Firenze, Italy [via http://brunelleschi.imss.fi.it]. bered many original notebooks. ca. 1478-1518 and consists of 1119 sheets. then reduced to issues of lighting, within art and science speculations. 39An interesting work on geometry during Islam period is Maitte, 2003. Plate from Summa by Pacioli (Pacioli, Summa, f. 1r)46. Mathematical arguing in Pacioli’s Summa (Pacioli, Summa, f.
more adequate arguments are reported only. roportional.” (Commandino, 1575, Defs. 5-6; see also Commandino, 1565). dine de più proportioni e al manco de doi” (Pacioli, Summa, 72v). On the fractions (Pacioli, Viribus, 20v, 21r)49.
the other safe numbers with backward reasoning]. (119 soldi) as he claimed (da Vinci, Codex Atlanticus, f. 288r f.
master Luca” (da Vinci, Codice Atlanticus, f. 331r [120r]). called deaf roots (radici sorde). (da Vinci, Codex Forster I, f. 19r). 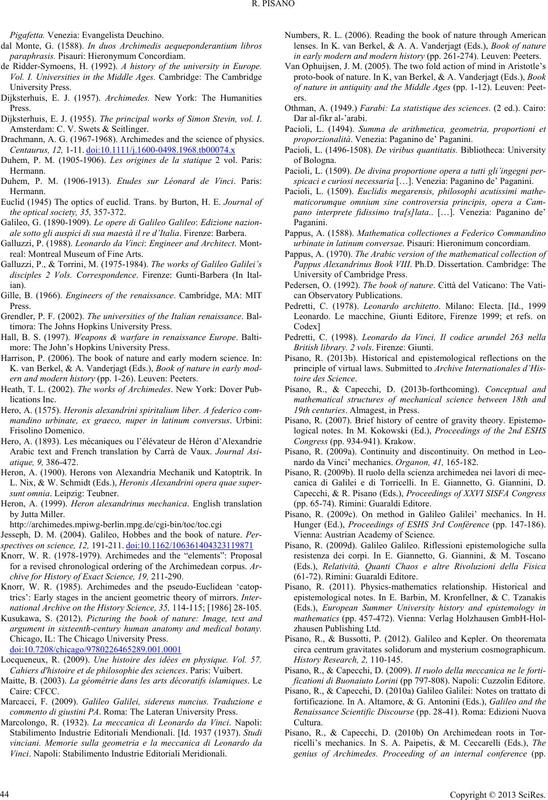 proportione (1498) are evident examples. 52This Codex Forster is composed of two manuscripts totalling 159 leaves. Codex Forster I from f. 14r to f. 22r includes speeches on Summa’s theory. matic and realistic approach to the mathematical problems. (Pisano, 2009; Pisano & Rougetet, 2013). names as presented in the Arbor proportionis. 53da Vinci, Codex Windsor, RL 12656; see also f. 17r. 54da Vinci, Codex Atlanticus, f. 28v. ity problem appears when a theory is included in another theory, e.g. and in every active force in existence57. adapted for his Euclidean work (Pacioli, Euclidis, f. 32rv-33r). 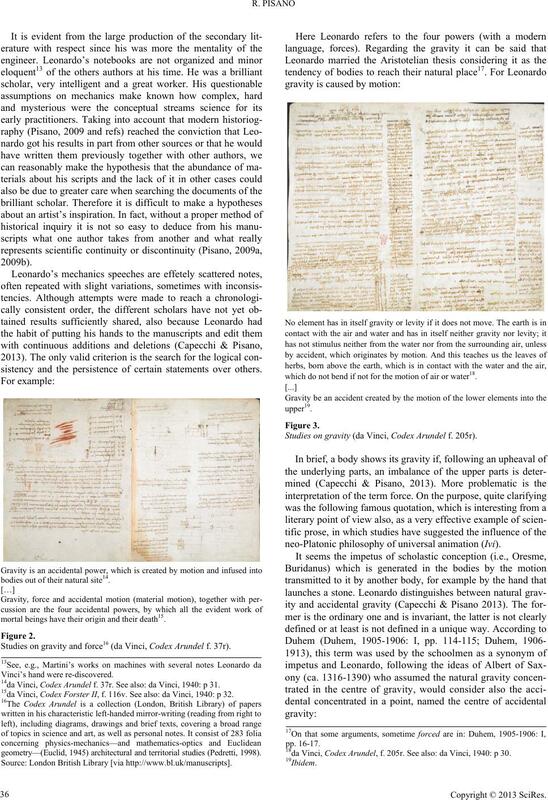 Leonardo only adding by ragione (reasoning, a sort of proof). tions (da Vinci, Codex Forster III, fs. 68v-69r). sented to him by Luca, who calls it Divine proportione. portion by Luca so I avoided to be reported. comments and suggestions to improve the quality of my paper. in a comparative perspective. 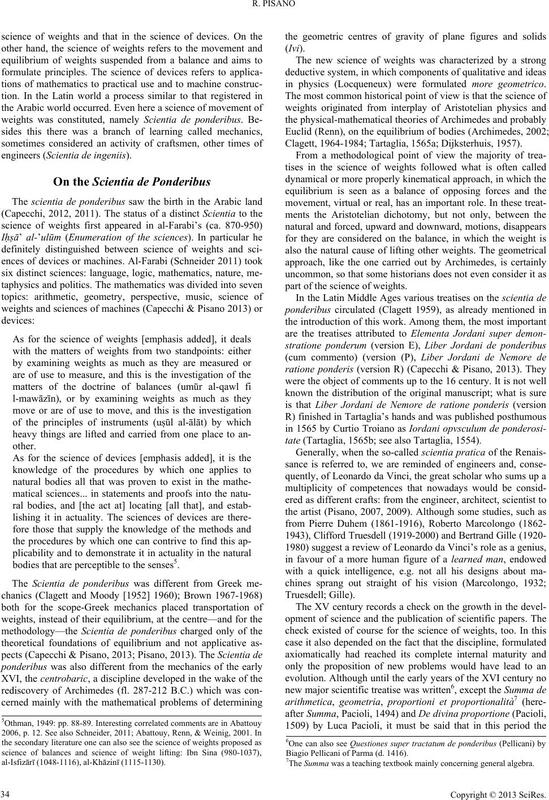 Science in Context, 14, 1-12.
ino Urbinate nuper in latinum conversa et commentariis illustrata. 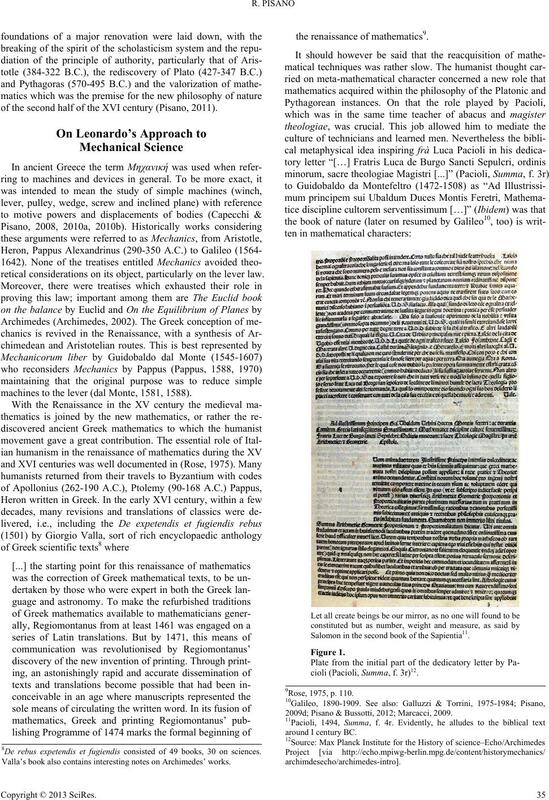 The works of Archimedes (pp 189-220). New York: Dover. Aristotle (1853). On the definition and division of principles. In: O. F.
P. Owen (Ed. ), The organon, Or logical treatises, of Aristotle (pp. 263-266). London: Bohn H G.
Aristotle (1955b). Mechanical problems. In: W. S. Hett (Ed. ), Aristotle. Minor works. Cambridge: William Heinemann. Aristotle (1999). Physics. Oxford: The Oxford University Press. Bagni, G. T., & D’Amore, B. (2007). 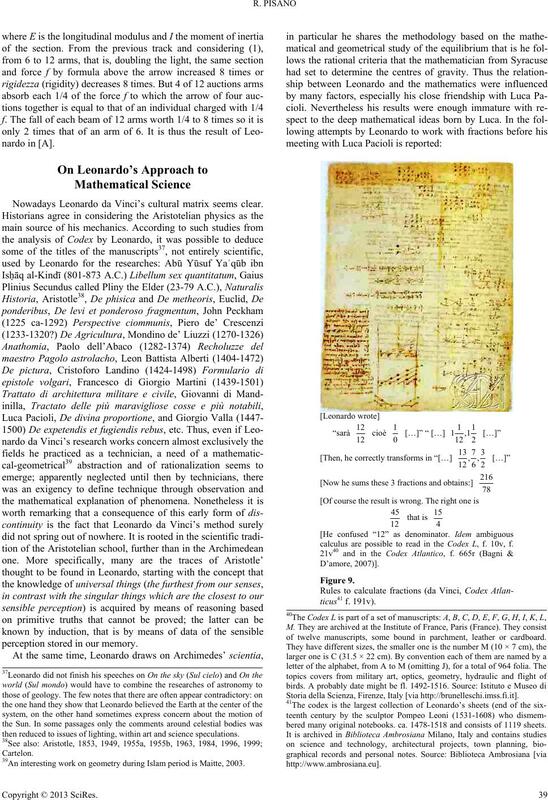 Leonardo e la matematica. In: I.
quanto non reali. Venezia: Roberto Meietti. dle Ages. Ph.D. Dissertation, Madison: University of Winscosin . and Euclid’s elements I. Stuttgart: Franz Steiner Verlag. Capecchi, D. (2012). The history of virtual work laws. Basel: Springer. ple in mechanics. Organon, 42, 81-98. Cartelon, H. (1975). Does Aristotle have a mechanics? In Barnes et al. (Eds. 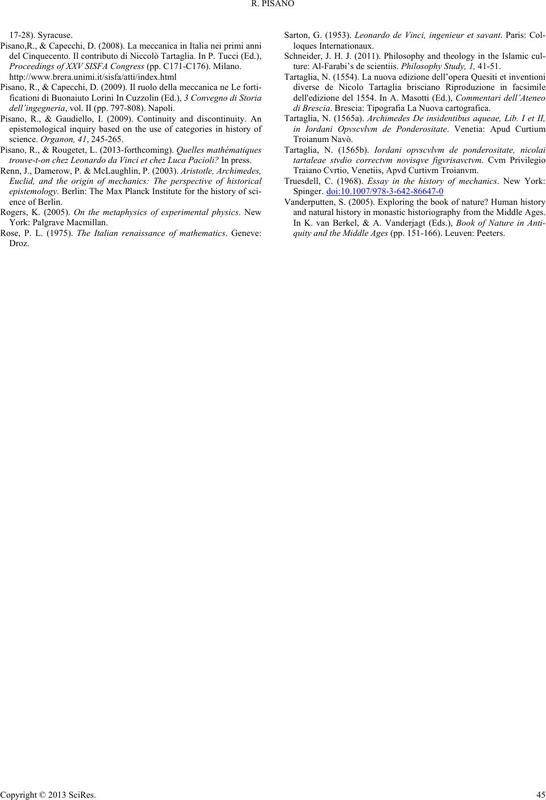 ), Articles on Aristotle. Vol. I: Science. London: Duckworth. Clagett, M. (1959). The science of mechanics in the Middle Ages. Madison: The University of Wisconsin Press. ford: The Clarendon University Press. Clagett, M., & Moody, E. (1960). The medieval science of weights. Scentia de ponderibus. Madison: The University of Wisconsin Press. gravitatis solidorum. Bononiae: Ex Officina Alexandri Benacii. 57da Vinci, Ms K, f. 49r; see also Codex Forster I, folia. 1-40.
de Ridder-Symoens, H. (1992). A history of the university in Europe. Dijksterhuis, E. J. (1955). The principal works of Simon Stevin, vol. I.
Amsterdam: C. V. Swets & Seitlinger. Drachmann, A. G. (1967-1968). Archimedes and the science of physics. 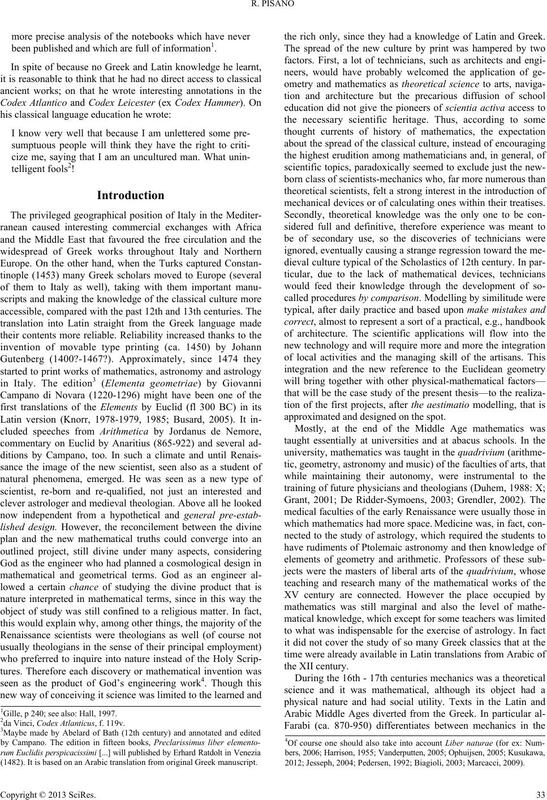 the optical society, 35, 357-372.
ale sotto gli auspici di sua maestà il re d’Italia. Firenze: Barbera. real: Montreal Museum of Fine Arts. timora: The Johns Hopkins University Press. more: The John’s Hopkins University Press. ern and modern history (pp. 1-26). Leuven: Peeters. chive for History of Exact Science, 19, 211-290.
national Archive on the History Science, 35, 114-115;  28-105.
argument in sixteenth-century human anatomy and medical botany. Chicago, IL: The Chicago University Press. Locqueneux, R. (2009). Une histoire des idées en physique. Vol. 57. Cahiers d'histoire et de philosophie des sciences. Paris: Vuibert. commento di giustini PA. Roma: The Lateran University Press. Vinci. Napoli: Stabilimento Industrie Editoriali Meridionali. in early modern and modern history (pp. 261-274). Leuven: Peeters. proporzionalità. Venezia: Paganino de’ Paganini. spicaci e curiosi necessaria […]. Venezia: Paganino de’ Paganini. urbinate in latinum conversae. Pisauri: Hieronimum concordiam. British library. 2 vols. Firenze: Giunti. 19th centuries. 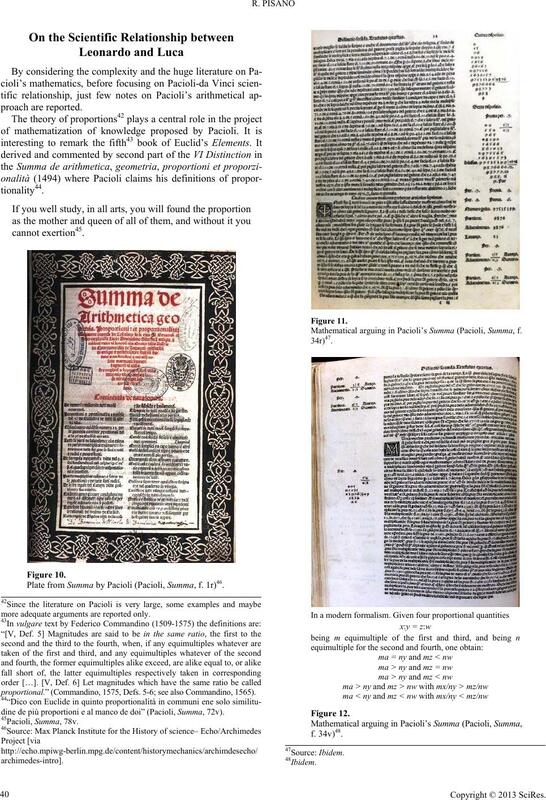 Almagest, in Press. nardo da Vinci’ mechanics. Organon, 41, 165-182.
canica di Galilei e di Torricelli. In E. Giannetto, G. Giannini, D.
(pp. 65-74). Rimini: Guaraldi Editore. Pisano, R. (2009c). On method in Galileo Galilei’ mechanics. In H.
Hunger (Ed. 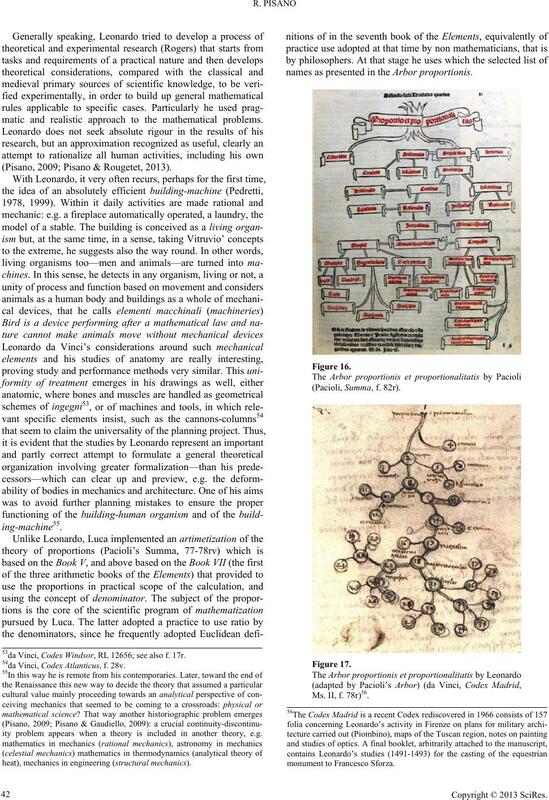 ), Proceedings of ESHS 3rd Conférence (pp. 147-186). Vienna: Austrian Academy of Science. circa centrum gravitates solidorum and mysterium cosmographicum. ficationi di Buonaiuto Lorini (pp 797-808). Napoli: Cuzzolin Editore. genius of Archimedes. Proceeding of an internal conference (pp. Proceedings of XXV SISFA Congress (pp. C171-C176). Milano. dell’ingegneria, vol. II (pp. 797-808). Napoli. 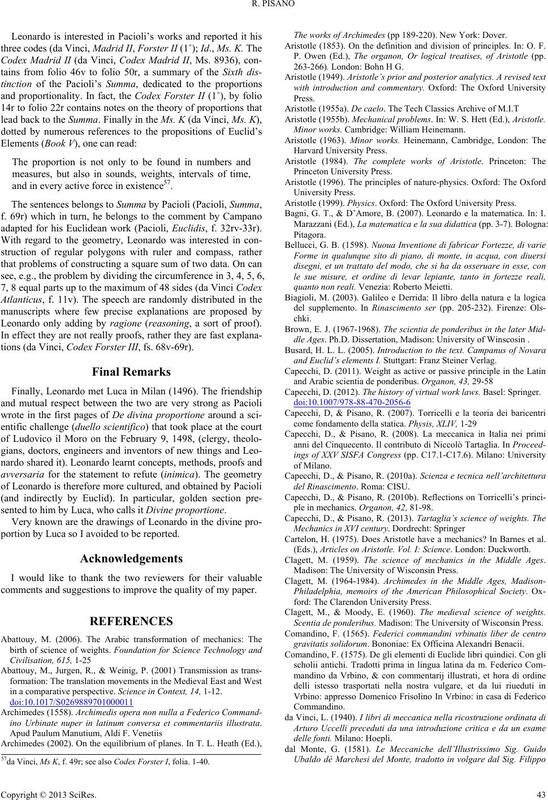 trouve-t-on chez Leonardo da Vinci et chez Luca Pacioli? In press. ture: Al-Farabi’s de scientiis. Philosophy Study, 1, 41-51.
di Brescia. Brescia: Tipografia La Nuova cartografica. Traiano Cvrtio, Venetiis, Apvd Curtivm Troianvm. and natural history in monastic historiography from the Middle Ages. quity and the Middle Ages (pp. 151-166). Leuven: Peeters.